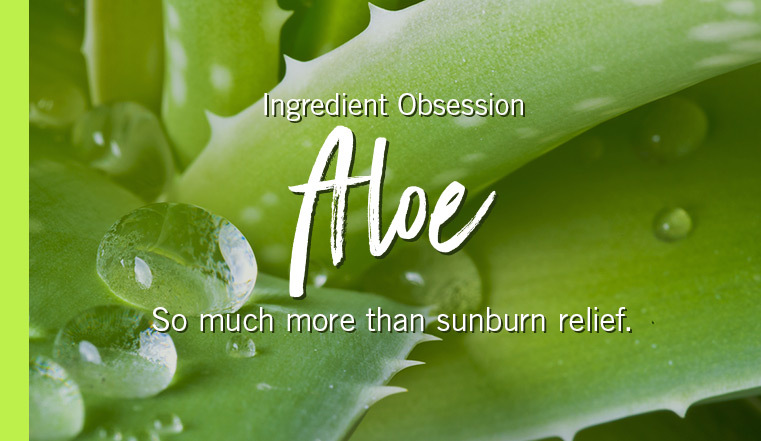 Aloe vera needs no introduction. It’s one of the most common ingredients in skincare products found in everything from body cream to sunscreen. But what might surprise you? Aloe vera and aloe are two different things. Aloe vera is a specific type of aloe – out of more than 500 worldwide! The effective parts of aloe vera are found in the gel (which is located in the cells in the center of the leaf) and the latex (which is found in the cells just under the skin of the leaf). These two components are what are used in products that provide the skincare benefits we know and love. WHAT ARE THE SKINCARE BENEFITS OF ALOE VERA? It moisturizes skin. Especially oily types. It’s a natural moisturizer that, like coconut oil and hyaluronic acid, creates a protective shield to lock in everything. The best part? No greasy-after feel – perfect for oily skin types. It’s anti-aging. Loaded with vitamins and good-for-your-body nutrients, aloe can plump up and hydrate skin – key to warding off wrinkles. It soothes sunburns. This one almost needs no explanation. You get a bit too much sun. You rub in the aloe vera. Ahhh. But it doesn’t just soothe. All the antioxidants and goodies inside the “plant of immortality” (that’s what the Egyptians called it) help the skin heal faster. It’s anti-inflammatory. Bad news for acne, blisters, stretch marks, skin flare-ups. Good news for you. This plant heals.